Description: Heritage House is excited to announce the release of our new pregnancy test, the Heritage House Quick & Clear II. This test is consistent and accurate giving a reliability that you will love. Plus, the Quick & Clear II shows results up to 2-minutes faster than other similar tests with a read time of only 3-minutes. Heritage House has been working to bring you the new Quick & Clear II test for almost 9 months since the manufacturer announced that the original Quick and Clear test would be discontinued. During that time we researched, compared, designed and tested to bring you a high quality test at the price your ministry can appreciate. The Quick & Clear II is the culmination of this work. Quick and Clear II is very sensitive at an hCG detection level of 20 mIU/ml, which is equal to or better than any urine based test currently available. The Quick & Clear II test has new functional and contemporary design elements. The included dropper receptacle keeps the dropper secured and in easy reach. The deeper and wider sample well reduces the chances of any spillage and the bright (T)est and (C)ontrol labels make the results stand out clearly. With the new features and distinctive cassette design both your center and your clients can feel confident in the results. But, we have even better news! Even with all of these improvements there is no increase in the low cost you have become used to from Heritage House! If you are on regular shipments your pricing will stay the same as will the pricing if you buy boxes as you need. Either way, you are getting a great test at a great price. Accurate, easy to read, and the price is great! They're very handy and pretty self explanatory. We appreciate these tests that are accurate and easy to use. The pricing is great also! We have been using the Pregnancy Test, QUICK & CLEAR II for several years now. They are always reliable. I am the nurse manager of a small pregnancy center and have been using Quick and Clear pregnancy tests for 2 years and I wouldn't consider using any other brand. We have had positive pregnancy results as early as 3 weeks and two days gestation. Our pregnancy clinic has used the Quick & Clear II tests exclusively for the past 6 plus years. It is reassuring to know that we use tests from a quality company, committed to life, that we can trust! Very easy to use and comes with good instructions. Our center uses only these pregnancy tests. They are accurate and dependable. Easy to use and read. This is the only pregnancy test we use. It gives a clear result in 3 minutes (or less), and is consistent at a fair price. These tests are an excellent product. Easy to use. Very accurate. As the Client Care Coordinator of our Centre we have used the Quick and Clear 11 and am very pleased with the tests. They simple to use and very easy to read. Thank you for this product. I have used Quick and Clear II tests exclusively for years and will continue to use these reliable and easy to read tests and get clear results for a great price! We have had very good results with the Quick and Clear II tests . The accuracy is excellent and the price is very good as well. Truly enjoy the years we have worked with Heritage House. Using the Quick & Clear II Pregnancy Tests provides "quick & clear" results for clients to read -- using 3 drops and seeing the answer in 3 minutes is great. Also being able to receive them through auto-shipments is very helpful (so I don't forget to order more!). This is a great product. I like the capability of having a reoccurring order every month. It is so convenient and you never have to worry about running low on tests. The Quick and Clear pregnancy test is a one-step process with a built-in quality control check. So simple to use --just add three drops, wait three minutes and ta-da! Results. Can detect pregnancy as early as 1 day after a missed menses. Also, conveniently able to store at room temperature. We use it for the center and they work really well. It's great to have a pregnancy test that you can rely on and advertise to your clientele that it is quick and accurate. These pregnancy tests are so much better than the previous tests we used. And Heritage House gives great customer service! These are the best pregnancy test we have ever used. The are truly quick to use and very clear to read. We use these pregnancy tests at our office and we love them! They are extremely easy to use and the results show up very quickly. We depend on these tests every day and they never let us down. So exciting to see the new design of Quick & Clear II. It is easier to use and it looks very professional. The nurses like how the results are clear to read and its accuracy. We are so pleased with these new tests. They are easy to read and work very quickly. I like how quick the Quick and Clear II are- most often less than 3 minutes. I find them easy to use and accurate. At times a pink haze has formed in the top part of the window when urine was first added I was worried that this would tamper with the results but it has not. We have been using the Quick and Clear tests at CPC for several years now. They are easy to use and economical. They also have a professional look. At first I was sceptical about going to a test that takes up to five minutes to read (instead of three). I now prefer it, because that five minutes are quality counseling time with our clients that is an important addition to our time in the counseling room. Pregnancy tests are a must at our pregnancy center. 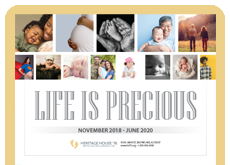 They are reliable and affordable and we are thankful to order them from a Christian organization that is pro-life! The new Quick & Clear II pregnancy tests are just that-- Quick (only 3 minutes for results now) and Clear (test results are easy for clients to read). I especially appreciate the accompanying poster that clarifies the test results when one of the lines is lighter than the other-- it helps the client feel more confident in how she is reading the result. I like the new test. It is quick and easy to read. It is reliable and accurate. Thank you also for the ease of automatic monthly ordering with a discount to boot. These tests are larger than the previous tests, and the results shows up quicker. They meet our needs well and are a great value! 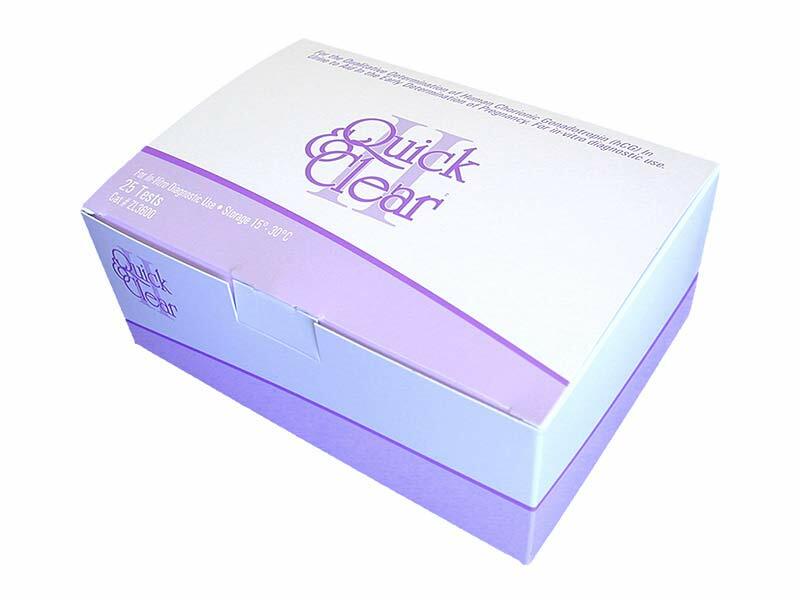 We recently started using the Quick & Clear II pregnancy tests. They are a better quality than the previous pregnancy tests we used. The tests are easy to use. The women can clearly read the results. The price is reasonable. As the director of a pregnancy center in a large city, I have been using the Quick & Clear II pregnancy tests for almost two years now. They are incredibly affordable and so easy to use. The results read so clearly and their compact size makes them easy to store. Since making the switch to Quick & Clear II, we have saved our agency quite a bit of money. I would not consider buying any other brand of pregnancy test after making the switch.